With David Letterman’s final talk show this week, I thought I’d list a few examples of favorite characters who’ve made appearances on (in-universe) talk shows of some sort. The latter character’s voiced by real-life daytime TV show host Al Roker. Kevin Keller once appeared along with the main Archie cast on Ellen DeGeneres’ talk show. There, they faced off against the head of “12 Million Moms”… who Ellen reveals only has membership in the triple digits, tops. Morgan Edge‘s Galaxy Communications was the owner of the “Daily Planet” during comics’ Bronze Age, and is once more in the New 52 reboot. Edge’s Galaxy Broadcasting System (GBS) television network was the home of the popular late-night talk show “The Midnight Show.” The show starred Johnny Nevada, the Earth-1 version of Johnny Carson. Clark Kent made an appearance on the talk show in “Action Comics” #442 (December 1974). “Histeria!” parodied several talk shows, including David Letterman. The most prominent parody might be “Histeria!”‘s version of Abraham Lincoln. His voice/mannerisms are a parody of Johnny Carson. 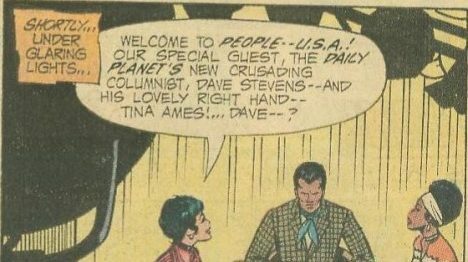 Mark Slackmeyer has been the host of an NPR talk show in-universe since the strip’s mid-80s return from hiatus. Mark co-hosted the show with his conservative husband during their short-lived marriage. Linda for a time was one of the co-hosts of the daytime talk show “The Scene,” a parody of ABC’s “The View.” Among her cohosts included longtime Batman comic character Vicki Vale.